Engraving of Abuna Salama III from Henry Stern, Wanderings among the Falasha. 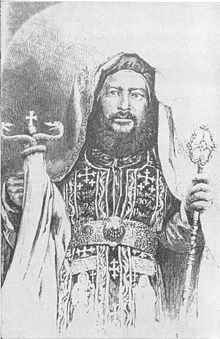 Salama III (died 25 October 1867) was Abuna or head of the Ethiopian Orthodox Tewahedo Church (1841-1867). Salama was originally brought to the Ethiopian Empire by Dejazmach Wube Haile Maryam. He afterwards attached himself to the party of Emperor Tewodros II for his help to settle the theological disputes dividing the Orthodox Church and to gain control over the fractured Church organization. As Tewodros' power dwindled, however, Salama found himself more often at odds with the emperor until he was made a prisoner (1864), and eventually confined to the village of Amba Mariam (then called Magdala in Wollo Province), where he died of bronchitis aggravated by his detention. This page is based on the Wikipedia article Abuna Salama III; it is used under the Creative Commons Attribution-ShareAlike 3.0 Unported License (CC-BY-SA). You may redistribute it, verbatim or modified, providing that you comply with the terms of the CC-BY-SA.